Intricately hand crafted mosaics will surely add another dimension to your wall. Mosaics - A painstakingly long process of assembling small pieces of glass, tiles etc. to form an artwork that is beautiful and a piece of joy! Mosaics find an interesting application in the interiors of a place and can enhance the ambience by adding a dash of color to it. One could go for a mosaic table top or just a wall décor that would catch your attention. 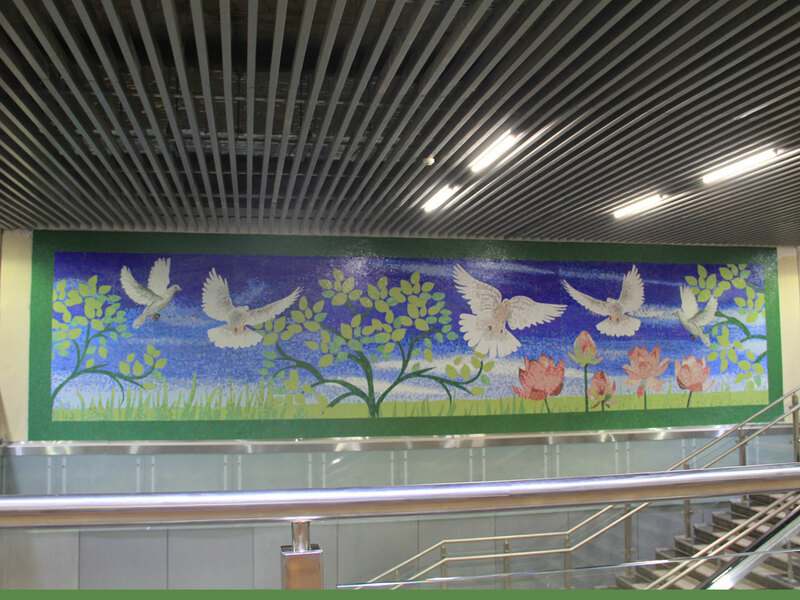 Mosaic murals find application in architectural installations as well wherein one single large wall could be covered in theme based mosaics to tell a story about the place. As an artist, I like to create mosaics and stained glass art that the clients can cherish for a very long time. I like to combine my own creativity with the requirement of the client. After understanding their specific need , I provide them with a rough sketch of the proposed design. Once approved, I go ahead with the actual creation of the mosaic or stained glass. While creating mosaics, I work with different colored glasses, where each and every piece is carefully handcut. I have created mosaics for clients in major cities of India like New Delhi, Ahmedabad, Kolkata, Lucknow, Chennai, Madurai and Mumbai. large scale mosaic wall murals for clients in public places as well as private residences. I got 4 mosaics done by Renu for my new home . One was a massive 8 x 4 feet outdoor panel with sunflowers, which is affixed above the entrance to my home. The next was a 30x2.5 feet long panel depicting a tropical forrest. The other two were a mirror frame & a round table top. The designs and color schemes of each of the four mosaics was arrived at mutually through use of e mail and WhatsApp. I am delighted with the results. Each of them is exquisite and just as imagined. 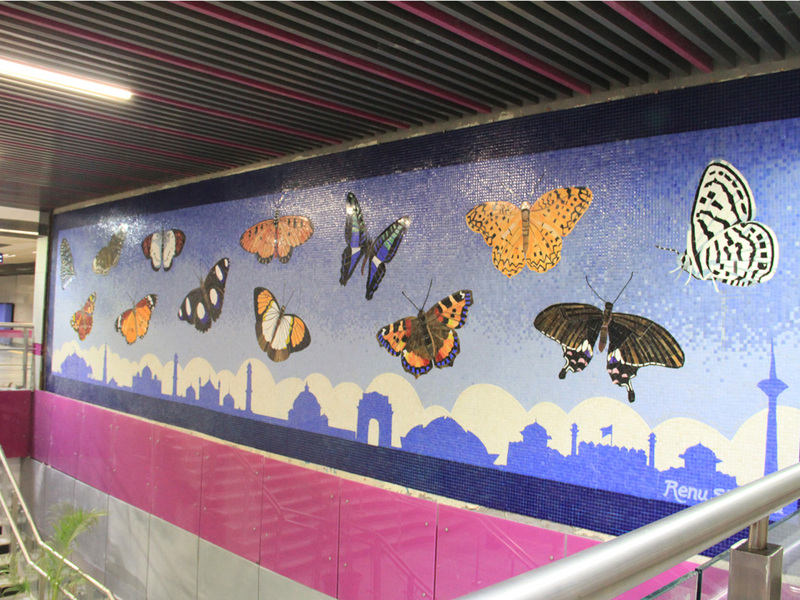 I must say that Renu is very creative at conceptualizing designs of the mosaics . Once the design is finalized, she executes them flawlessly. Here sense of color shades & combinations coupled with flawless execution gives birth to masterpieces. It was indeed a big delight to have Mrs Renu Sharma beautify the walls of my residence. The artistically done walls in mosaic clearly stand out at the first glimpse of my home. The accurately done butterfly in my bedroom, the exclusive den room art work & the tulips in the dining area all are perfectly suited to their placing & purpose. And the best part is that such a masterpiece is also maintenance free. I really feel privileged to be associated with her and benefited to have a piece of her creativity into the walls of my apartment. I thank you for all your admirable inputs in my home. Whether you are a corporate or individual looking for some classic artwork for your home or office decor, do not hesitate to drop in your requirements and I will be happy to address your queries.